This spacious accommodation, with plenty of storage (closets / wardrobes) is located facing south. Bright, pleasant together. The ground-garden: (no stairs: disabled access disabled). It consists of a kitchen with pantry / laundry room, a lounge / living room (sofa bed for 2 people), bathroom with walk-in shower, vanity unit and toilet, direct access to private garage. On the floor: 2 rooms. One of 30 m² with large terrace (open views of the surrounding countryside), bed 140 plus an extra bed 70. In the second bedroom: two beds in 90. Bathroom, and independent toilet. Access by private road, parking, fenced and shaded courtyard, quiet, without vis-à-vis. Home of the contiguous owner. 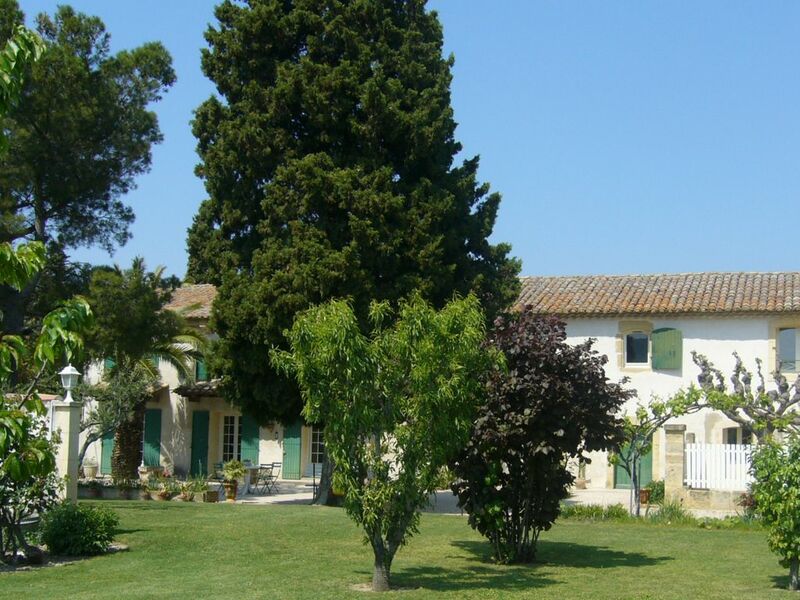 Proximity to all shops, varied sports activities, municipal swimming pool 800 m.
15 minutes from Avignon TGV station, 5 km A9 motorway exit. Mas from the early eighteenth century (before 1734) completely renovated, located on the outskirts of a small town appreciated for its history and heritage. Between Provence and Languedoc, its main roads are conducive to radiation between these two regions. A short distance from prestigious architectural sites such as the Pont du Gard, the Palais des Papes in Avignon, the Roman Theatre of Orange, the Arena of Nimes, and exceptional natural sites: the Fountain of Vaucluse, Gorges du Gardon The Cèze valley, Vallon Pont d'Arc, Mont Ventoux ... and many international cultural events: the Avignon Festival, the Chorégies of Orange. The wine lovers and wine lovers will find themselves at the heart of the famous wine appellation "Côtes du Rhône", many hiking trails. A whole range of occupations and discoveries that you can organize from this cottage, quiet, in the countryside in an old farm. We stayed in this beautiful gite for 3 nights in September as part of an extended driving trip through Europe. It was our first visit to the Provence area of France, and you definitely need a car in this area. We were greeted by Régine and Martin when we arrived, and even though Régine does not speak English, she had printed out instructions in English for everything we needed to know for the house. She also has a great sense of humor. The house itself is very large for a 2 bedroom . The master suite with terrace is gigantic. The house has a large private courtyard and even an enclosed garage. The views were magnificent. It is situated on a large farm property where herbs are grown, so the views from the upstairs terrace were of acres of greenery. Since our hosts live next door, it was easy to ask for help any time we needed to. Everything in the house was very clean and well maintained. On arrival, we were given grapes (from their own vineyard), a bottle of Rose wine, and a beautiful (homemade) apple tart. It is a short drive to Pont du Gard (Régine had given us a 30% discount coupon) , which was beautiful. We spent a wonderful afternoon there. We also drove a short distance to a Park and Ride in Avignon and took a free shuttle bus into the city center where we visited the Palace of Popes and other attractions. (It is not suggested to drive directly into the city center). There are a few grocery stores in the town close by, so it was easy to pick up supplies. The weather was so good we barbecued one evening in the courtyard. We would love to come back and stay longer on our next trip. Séjour bien sympathique dans un beau mas à Roquemaure . Merci à la famille Martin pour son accueil chaleureux à notre arrivée et sa disponibilité tout au long de notre séjour. Nous avons beaucoup apprécié leur gite dans un grand mas confortable, proche des commerces tout en étant entouré de verdure. A 4 personnes, nous ne nous gênions pas , nous nous sentions bien ! Nous serions bien restés un peu plus longtemps !...Nous espérons pouvoir revenir dans ce mas, chez cette sympathique famille. In diesem geräumigen und sauberen Haus haben wir einen sehr schönen Urlaub verbracht. Die Küche ist gut ausgestattet und die Zimmer sind geschmackvoll eingerichtet. Régine und Gérard Martin sind sehr freundliche und herzliche Vermieter, die jederzeit ansprechbar und hilfsbereit sind, wenn man Fragen hat. Gérard ist pensionierter Winzer und berät gerne in allen Fragen, die den Cote du Rhone betreffen. Es ist möglich, Fahrräder auszuleihen, die sogar bis zum Haus gebracht und abgeholt werden. Mit dem Auto kann man viele wunderschöne Orte in der Umgebung besichtigen, allen voran Avignon, das ganz in der Nähe ist. Ein kleiner Nachteil war der unzureichende Internet-Zugang, der nicht jeden Tag und vor allem nicht in jedem Raum vorhanden war. Vielleicht wird diese kleine Einschränkung in der nächsten Zeit behoben. Wir haben 3 Nächte hier verbracht und wir können das Haus guten Gewissens weiterempfehlen. Es ist sehr sauber und gepflegt und mit allem ausgestattet. Très bon accueil. Maison très agréable avec une magnifique vue sur la campagne. Couple charmant et attentionné. La maison est confortable, pratique, bien équipée. Nous avons beaucoup aimé notre séjour.